October has arrived and new mambi Design Team member Marisa Yciano (IG | blog) is in the Halloween spirit! Marisa was super excited to use the 'Seasonal' 1000+ sticker value pack for Halloween and used the purple, orange, and black colors with some gold accents. 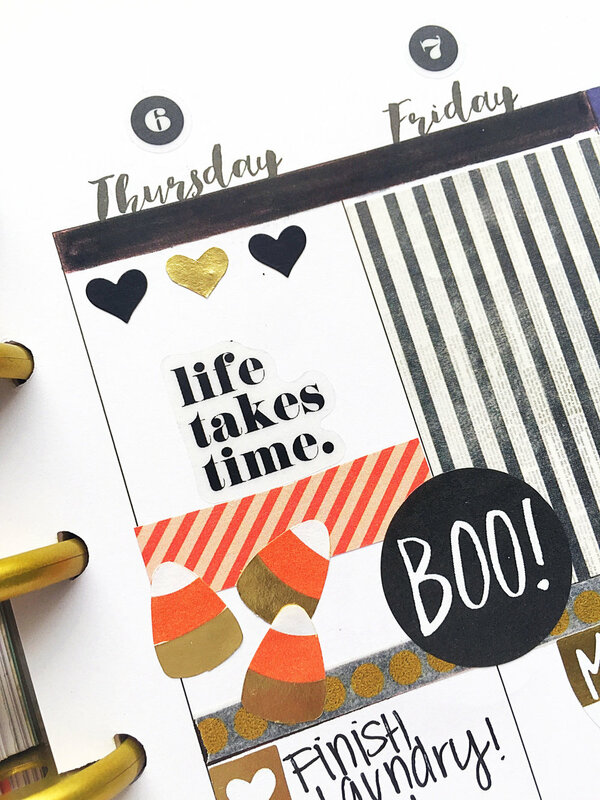 "I didn't have much going on during the week so I really loved the full-coverage patterned stickers that fit perfectly in the weekly boxes. The box stickers are super cute and great at covering up the space I won't use. I also like to cut up some of these boxes and use them as a little background. I did this for the candy corn and the poison bottles to keep it from blending in with the white background. Every week I love to have a little 'note to self' section where I typically add a quote. This weeks quote was the 'Live in the Moment' because sometimes I can get carried away being so busy I forget to enjoy the moments I have now." Shop supplies Marisa used by clicking on the items below.